Death of Fenian leader and nationalist Jeremiah O’Donovan Rossa (b 1831). He won election to the House of Commons for Tipperary in 1869, even though he was serving a life sentence in England for treason for plotting a Fenian rebellion. Released from jail on the understanding he would not return to Ireland, he travelled to the United States with a number of other Fenians who became known as The Cuba Five. He continued to plot activity against England even while in the United States. 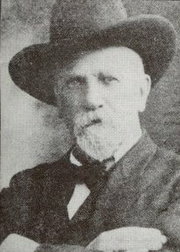 See O’Donovan Rossa funeral on YouTube. 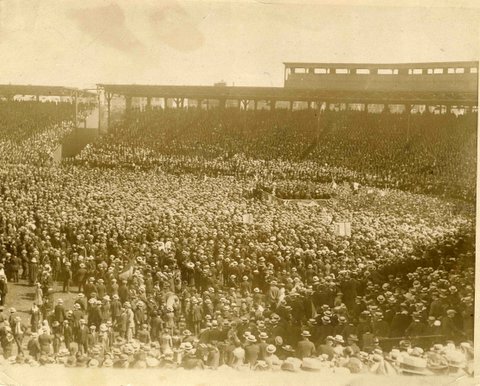 Eamonn De Valera makes his first major presentation in the United States at Boston’s Fenway Park to a huge audience. De Valera spent many months in the United States during the War of Independence generating funds for the cause. The official Fianna Fail site states he raised over $5 million. Much mystery surrounds De Valera’s entry to America. Month’s previously he had escaped from Lincoln Jail in an episode that even to this day continues to have an element of intrigue and mystery to it. U2 play Croke Park Dublin for the first time as part of their Unforgettable Fire tour. Support bands included REM! Below is a page from For the Love of Being Irish – An A-Z of Ireland. BUY Author signed copies for For the Love of Being Irish HERE.